﻿The Anselmian Abbey Players put on seven productions a year. 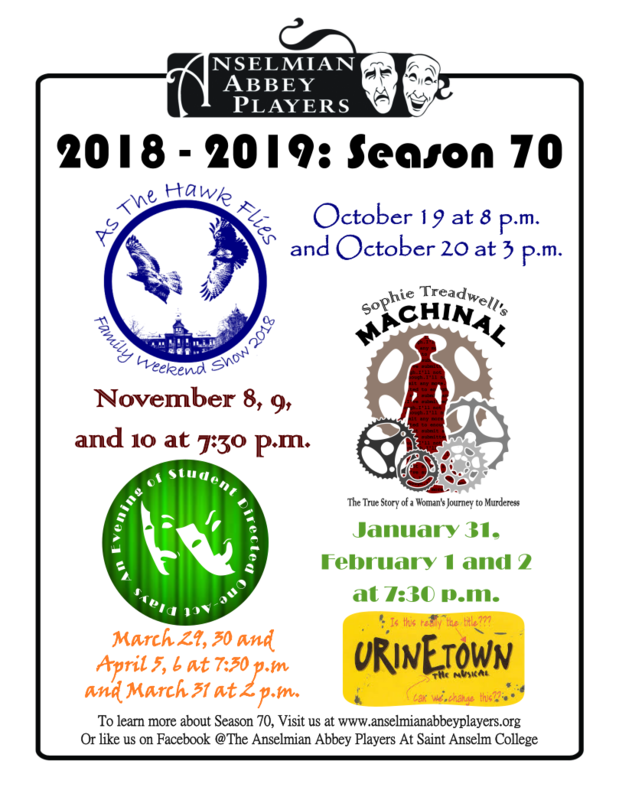 We put on A Family Weekend Show, Talent Show, Fall Show, One-Act Play Festival, Cabaret, Spring Musical, and Shakespeare Scenes in the Annual Celebration of Shakespeare's Birthday. If you want information on each production, please hover over "our series" and click the show you would like more information on. The Talent show, "Saint A's Got Talent", is hosted by the Abbey Players and is open to any member of the student body and to all acts. It is produced by a student board member. The various acts always aim to please! October 4, 2018 at 7:30 p.m. The Spring Cabaret is hosted by the Abbey Players and open to any student singer. It is produced by a student board member and directed by a student director. The Spring Cabaret of show tunes has a set theme of arrangements. The Shakespeare Scenes are done on or around Shakespeare's birthday. Along with reading all of Shakespeare's Sonnets, student directors from the Abbey Players take on the challenge of directing a scene from one of Shakespeare's masterpieces!